JAL and Cathay Pacific expand code sharing agreement. Image by Japan Airlines. 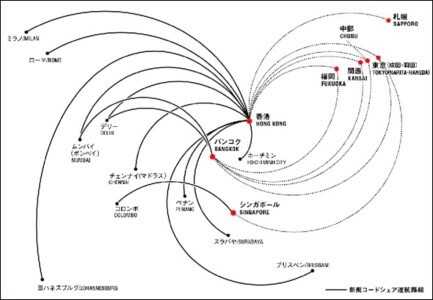 Japan Airlines (JAL) and Cathay Pacific Airways (CX) has reached yet another code sharing agreement to allow JAL to place "JL" codes on CX's flights to other cities around the world from Nov 1 2010. This is the third expansion agreement met between the two airlines within a month. The new agreement covers 13 routes and 11 destinations in Asia, Europe, Oceania, and Africa! Reservations starts on Nov 1 2010. Below is the schedule of the codeshare flights, all operated by CX.